Aug. 15, 2017 | Aug. 15, 2017 | Lawrence O’Malley, M.D., a sports medicine specialist, has joined the University of Arkansas for Medical Sciences (UAMS). 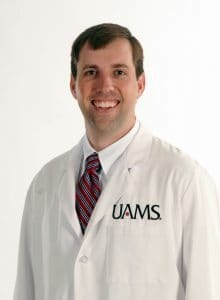 O’Malley will be an assistant professor in the UAMS College of Medicine’s Department of Orthopaedic Surgery. He will see patients at the UAMS Orthopaedic Clinic at Autumn Road. O’Malley provided care for all Clemson University athletics, including the football team, from 2013-2015, and for Tulane University athletics from 2015-2016. Before coming to UAMS, O’Malley was the head team physician at the University of Tennessee-Martin and provided care for the Jackson Generals, the Double-A affiliate of the Arizona Diamondbacks. O’Malley earned his bachelor’s in 2006 at Murray State University and his medical degree in 2010 at the University of Tennessee Health Science Center in Memphis. He completed his internship and residency at Greenville Health System’s Steadman Hawkins Clinic of the Carolinas in Greenville, South Carolina. O’Malley completed an orthopaedic sports medicine fellowship at Mississippi Sports Medicine and Tulane University. O’Malley is a member of the American Academy of Orthopaedic Surgeons, American Orthopaedic Society of Sports Medicine, Arthroscopy Association of North America and the Southern Orthopaedic Association.